Nab the CHI with Rizzo's extended hook! Fire the eagle cannon and repel the ravens! 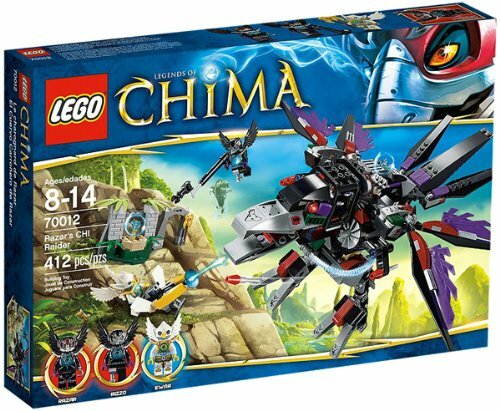 Grab the Eagle tribe CHI with Razar's CHI Raider! Includes 3 minifigures with a weapon. Use the 4 flick missiles, rear storage bay and poseable beak, wings, tail, legs and talons to battle past the Eagle tribe's defenses! unless Rizzo can sneak by to swipe the CHI with his hook tool! Ewar's only defense against the raucous raven is to energy up the CHI cannon and send Razar flapping back to his nest. 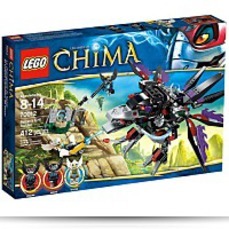 Climb by signifies of the clouds and up to the Eagle tribe's CHI temple inside the sky with Razar's CHI Raider!